From the same man who brought you the quadraphonic best-of-2012 STEREO comes this very exciting collaboration with the newly-formed ExCathedra Records: Mivos Quartet // Patrick Higgins: String Quartet No. 2 + Glacia, to be released on LP/CD on November 11, 2013. 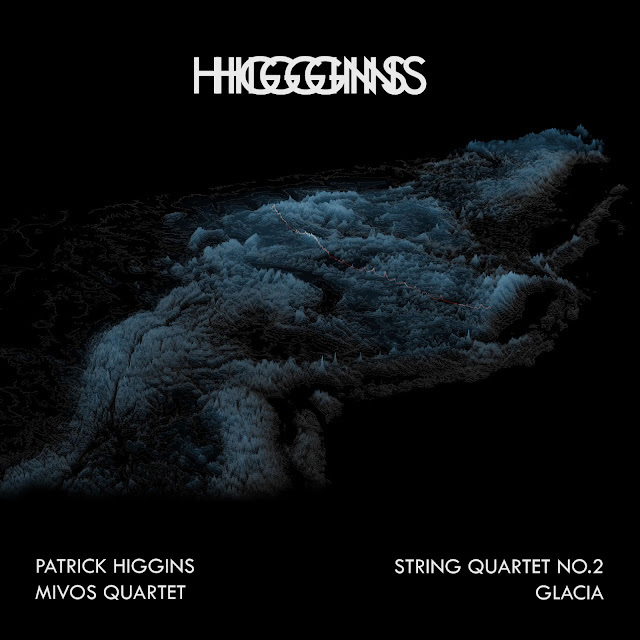 Part one of this beautiful release features Mivos Quartet playing Patrick Higgins' String Quartet No. 2, a seven-movement work that explores the function of memory and recollection as musical forms. Developing across a palindromic movement structure, the quartet moves through a cycle of compositional styles from diatonic tonal material, to atonal, lyrical writing, to twelve-tone, micro-tonal, and indeterminate materials --the work is concerned with the ability of musical form to reconstruct or "remember" across extreme developments in material. Part two sees Higgins reworking Higgins in an experimental re-imagining of SQ2. At moments evoking the spirit of STEREO, Glacia is inspired by the interchange of the perceptual and physical properties of ice fields, music that is at once static, monolithic and integrated, while still fluid, fragile, dynamic, and fleeting. In posting an exclusive preview "Wind Tunnel" from the Glacia disc, Adhoc.fm sez "Patrick Higgins truthfully inhabits the personas of both shredder and composer...shredder in the Yngwie/Satch paradigm...[yet] a legit modern classical entity." Click thru for the preview track! Come out to an exclusive preview show on October 4 at (le) poisson rouge (tix) with Buke & Gase, Mivos Quartet, and Patrick Higgins to hear the material performed live and pick up an advanced copy of the LP! Pre-sale is available below.